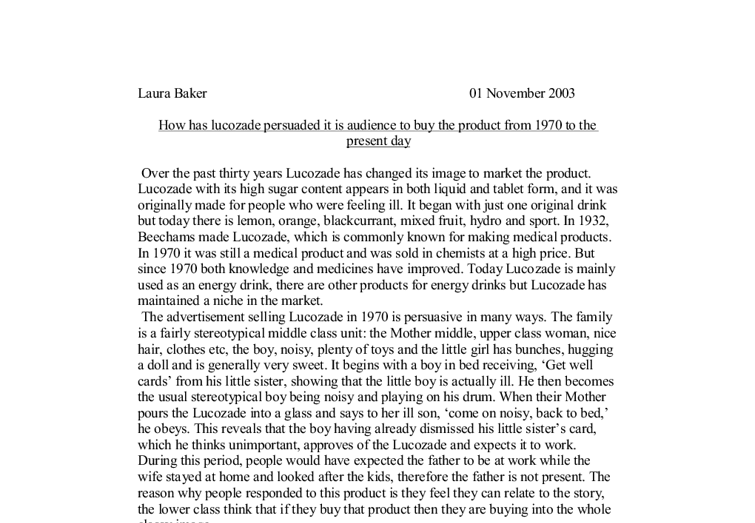 Laura Baker 01 November 2003 How has lucozade persuaded it is audience to buy the product from 1970 to the present day Over the past thirty years Lucozade has changed its image to market the product. Lucozade with its high sugar content appears in both liquid and tablet form, and it was originally made for people who were feeling ill. It began with just one original drink but today there is lemon, orange, blackcurrant, mixed fruit, hydro and sport. In 1932, Beechams made Lucozade, which is commonly known for making medical products. In 1970 it was still a medical product and was sold in chemists at a high price. But since 1970 both knowledge and medicines have improved. Today Lucozade is mainly used as an energy drink, there are other products for energy drinks but Lucozade has maintained a niche in the market. The advertisement selling Lucozade in 1970 is persuasive in many ways. The family is a fairly stereotypical middle class unit: the Mother middle, upper class woman, nice hair, clothes etc, the boy, noisy, plenty of toys and the little girl has bunches, hugging a doll and is generally very sweet. It begins with a boy in bed receiving, 'Get well cards' from his little sister, showing that the little boy is actually ill. He then becomes the usual stereotypical boy being noisy and playing on his drum. ...read more. The use of traffic lights is essential because when they are red he stops running as you would if you where in a car, which is followed by an orange light so he drinks Lucozade and gets ready to run. When the light goes green Daley leaps from the blocks and sprints. This is giving the sense that the Lucozade gave him energy to keep going all day. The bottle has changed dramatically since the 1970s; it is now plastic and more compact. Daley draws attention to this new look by flicking the bottle up into the air showing that it is light and not fragile and you can simply carry it around in your sports bag without the worry of it smashing. Music in this advertisement is vital as it sets a mood and gives a sense of atmosphere. The relevance of the music is that it is rock and as it gets faster as does the visual image, it is as though after Daley drinks the Lucozade it has given him sudden energy and everything speeds up. 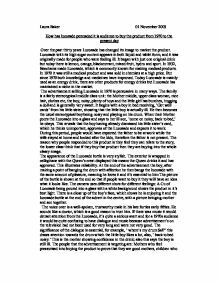 The only bit of dialogue in the commercial is at the end when Des Lynam, a television sport presenter says " Lucozade the refreshing glucose drink", which is telling everyone that instead of being a medical drink it is now a sugary energy drink for sport. ...read more. The soundtrack contrasts with the Daley Thompson advertisement, it uses very thrilling, high-pitched strings, although both advertisements have no dialogue. Dialogue isn't appropriate for this because as the music moves along it imitates what Lara is doing this shows it s a typical horror movie and builds tension and suspense. For example when Lara runs out of bullets the music is high pitched and loud to create a scary environment.The Bottle itself has not changed and neither has the slogan but instead of regular sports its moved closer to dangerous interactive sport. Close ups are used here to show fear or seductiveness aimed towards males, for example when Lara is running along there are close ups of her bum and chest. A close up of the eye is used to highlight emotions, which is mainly fear. The target audience is mainly men because they created her but women want to be like her so they are also targeted. All of these advertisements are diverse but do have some similarity's for example the last two advertisements have some likenesses because the company is marketing the product through sport and energy. The market is opened up but each time to different cultures and themes. I see Lucozade image changing again in the near future but instead of promoting through sport it would have a 'Moulin Rouge' theme and move towards a posh, upper class outlook. Lucozade will be served in champagne flutes and presented at dinner parties for people who want to talk and dance all night! ...read more. If consumers do not have enough income they tend to settle for a substitute, which means a drink that is cheaper or would buy another drink instead. If family members do not Like coca cola then the Buyer will not buy my Product. Each will benefit you no matter what. If you go to university you get more education but less experience and if you forget about university and go on to working you might get more experience but less education so I say its best to do both at the same time like I did. Capitalizing on the eloquence of a local native, Carmelo Garcia, as the show's host, will bring a cadre of resources, which will be fundamental to the initial start-up of the television show. In addition, Hoboken Happenings will a create collection of products with the show's logo to be used for contests, promotions as well as direct sales. * Wine showing the fastest growth. * Growth in soft drinks led by energy products and water. * Lager sales driving the beer market. * Sales of spirits benefiting from premiumisation but penetration levels are falling. * Image is everything.